Walking through the immense halls of the Denver Convention Center, a steady stream of fleece-clad land trust professionals moved in and out of conference rooms, eager to share, network, and learn. 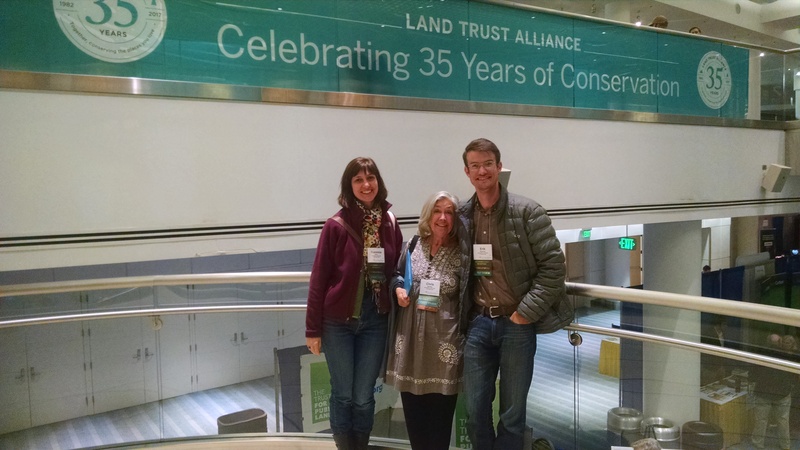 Welcome to the annual Land Trust Alliance Rally! This year Greenbelt Land Trust was fortunate to send three staff and two board members to ‘Rally’, immersing ourselves in seminars, workshops and field trips. Want to learn about the Risk Management of Fee Lands? There’s a seminar for that! How about Climate Resilience for Land Protection? Yep, you can find that as well. Critical Components of Successful Ballot Measures, or Voluntary Water Rights Transactions? Yes, even those. This is my sixth Rally, and every time I leave inspired by the sheer abundance of ‘team-players’ in the conservation community, as well as the depth of expertise that lies in the hands of the staff and volunteers of the 1700 land trusts across the country. As I put away my suitcase, my dog and cats eager to have me home, the lessons from Denver linger on. It feels so good to be part of a larger professional community that works tireless towards a common goal, ready to help lift up one another to achieve a bigger outcome for people like you and this place we all call home.